On Saturday 19 September, EH1 Music Festival 2015 returns to Ingliston, Edinburgh. For 2015, the event has nine arenas to help you party through its 13 hours. The Main Arena is courtesy of Defected In The House, and after a top set last year, they welcome back on board MK to headline. Arena 2 will be hosted by Cocoon, complete with Sven Vath and Eats Everything. 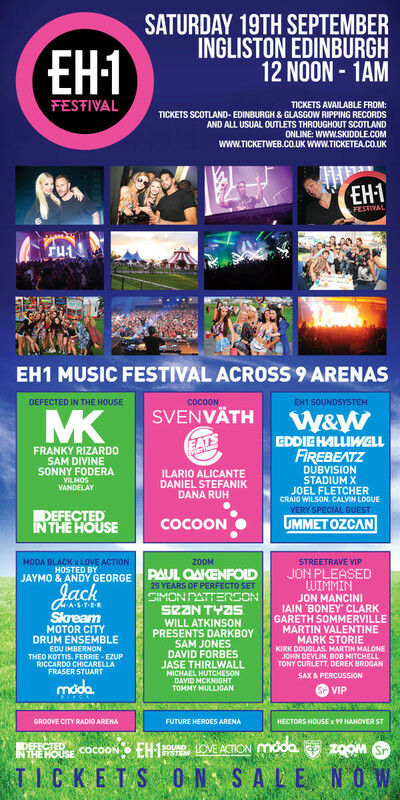 Arena 3 is hosted by EH1 Sound System and will be headlined by W&W, plus Eddie Halliwell is back again. Arena 4 will be hosted by Love Action & Moda Black, which will see Jaymo & Andy George play alongside Skream plus many others. Other Arena hosts include Zoom with Paul Oakenfold, Simon Patterson and many more. 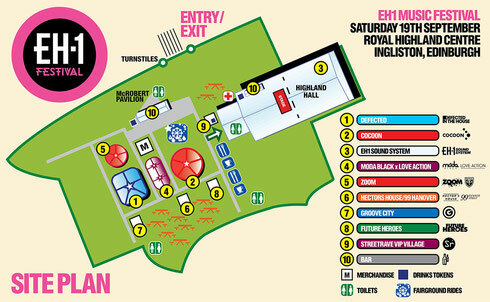 Also included is the STREETrave VIP Arena, Groove City Radio, Future Heroes and Hectors House x 99 Hanover Street. Each Arena will focus on the key elements of the genres they represent.